J loves to paint. 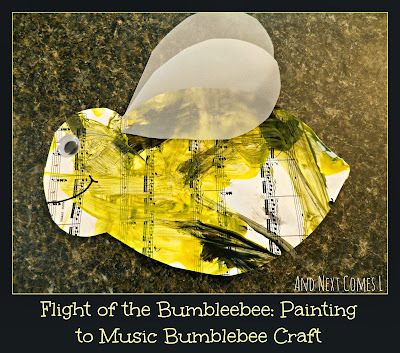 So to go along with our Flight of the Bumblebee music appreciation, I came up with this adorable bumblebee craft that combines music and art. First, I printed off a copy of the sheet music for "The Flight of the Bumblebee" from here. I chose to do a piano version by Rachmaninoff based on Rimsky-Kosakov's theme, but pick anything that you'd like. Then I gave the boys some black and yellow tempera paint. To set the mood, I played a recording of "The Flight of the Bumblebee" from this cd. You can also use a recording from youtube if you'd like. With the music playing in the background, it was finally time to paint. It's so interesting, to me at least, to see how J and K approach an art project. They are so different. J, for instance, started off by painting out the words "The Bumble Bee." He also wrote "the waters" and the number 33. Then he finally painted it like crazy, while staying almost completely clean and paint free. K, on the other hand, got messy. He's a toddler, what else can I say. Once the paint was dry, I cut out bumblebee shapes from their paintings. I then cut out two wings for each bee. I used vellum for the wings and fastened them to the bee body using a brad fastener, which means the wings can rotate. Then I drew a smile and glued a googly eye onto each bee. And here is J's bee. You can see the number 33 still on the body.